Airtel comes up with a new 499 recharge plan! Sri Ramachandra Murthy April 11, 2018 11:00 IST Airtel comes up with a new 499 recharge plan! 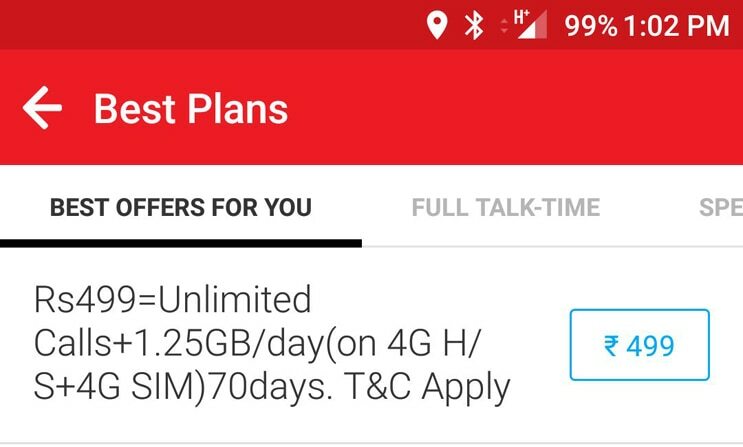 Telecom giant Airtel has come up with a new prepaid recharge plan of Rs 499, which offers 2 GB data daily. This package also includes 100 SMS per day free, besides unlimited local, roaming and STD calls, and comes with a validity of 82 days. At 2 GB offered per day, it amounts to an offer of 164 GB per user. While the prime competitors of Airtel, Reliance Jio and BSNL have already launched special data packs to coincide with the ongoing IPL cricket festival, Airtel has launched this new pack to facilitate its subscribers. It also enables Airtel Subscribers to watch all the IPL matches live and highlights of IPL for free, through Airtel TV application. Airtel also has another pack for Rs 499, which offers 1.4 GB per day for 82 days and similar calls and SMS facilities. On the other end, Jio had announced a special, exclusive Jio Cricket Season pack, with which the users can watch IPL matches on Jio TV for free, and users will be required to recharge 251 Rs for 102 GB, for a validity of 51 days, as Jio has partnered Hot Star. BSNL offers 3GB per day pack of Rs 248, for a validity of 51 days.